In Hindu astrology, Mangal Dosha is an astrological combination that occurs if Mars (Mangal) is in the one, two [Considered by South Indian Astrologers], four, seven, eight, and 12th house of the ascendant chart. A person born in the presence of this condition is termed a manglik. What is Manglik Dosha or Kuja Dosha? How is the Manglik Dosha formed in the Kundli? Why Does the Planet Mars Cause this Dosha? Why does the Manglik Dosha Impact One's Marital Life? Matrimonial Site for Indian Manglik Brides & Grooms for Marriage. Register Free! Manglik or Kuja Dosha is an astrological state when the native has the planet Mars located either in the first, fourth, seventh, eight or twelfth house. This condition is identified on the basis of the norms set by the ancient texts of Vedic astrology; and is considered to be among the most feared astrological conditions especially because of its negative influence on the marital lives of the native and his or her spouse. One can identify whether or not a native is a Manglik on the basis of studying their Kundli's or horoscope charts. The comparative analysis of the birth chart, the Navmansha and the Moon chart help determine whether or not the native is Manglik. As previously explained, the Manglik or the Kuja Dosha is formed when the planet Mars is placed in the 1st, 4th, 7th, 8th and 12th house from the ascendant, which is also known as lagna, Chandra lagna (the moon sign) in the lagna horoscope, Chandra horoscope or Navmansha horoscope. The worst form of this condition is considered when the planet mars is placed in the seventh house or in the ascendants. While these two placements are considered to be the most extreme, the placement of planet mars in the seventh house is believed to have the worst influence on the native and his or her spouse. Next in severity comes the placement of the eight, fourth and twelfth houses in descending order. A crucial loophole in the this entire system is that if a native who is a Manglik marries another native with the same astrological condition, then the negative effects of the dosha are deemed to have complimented or neutralized each other. 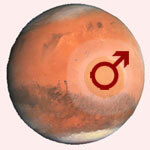 Mars is considered to be the most malefic and feared planets especially with respect to matters of marriage. The fierce nature of the planet and its placement in specific houses result in the manglik or the Kuja Dosha. Mars as a planet represents fire, electricity, weapons, aggression, chemicals, high energy, fight, accident and blood. It is because of this, that it is believed to influence the native, the spouse as well the relatives in a negative way. 1st House – If the planet mars is placed in this house, it will also impact the 4th, 7th and 8th houses. This house represents one's personality and it is believed that this person may have a short temper. Since the 4th house represents the house, vehicles etc, this could mean accidents due to fire, electricity, chemicals etc. On the other hand, the 7th house is representative of marital life and this placement of planets is known to create turbulence in marriage life, loss of a partnership, or divorce. The 8th house represents death or sudden monetary gains. There are possibilities of fatal accidents, etc. 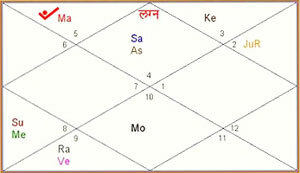 4th House – If the planet mars is placed in this house, it will also affect the 7th, 10th and 11th houses. The 10th house represents one's career, sleep and one's relationship with their father. This house influences frequent changes, sleep disorders, erratic career paths, and problems with the father. The 11th house suggest monetary gains and hence the chance of loss due to accidents and theft. 7th House – This position influences the 1st, 2nd, and 10th houses. The 2nd House is the house of wealth; the 7th and 8th houses represent death of a married life or business partnership. Hence this situation can cause problems among family members, lack of harmony due to temper or aggression. There are also chances of loss of money. 8th House – This influences the 2nd, 3rd, 11th houses. The 3rd house is representative of brothers and sisters; skills in verbal communication, voice, and achievements. This condition is known to create a stressful situation among siblings, rude and arrogant behaviour and the native may be known to frequently hurt feelings and face many failures in life. 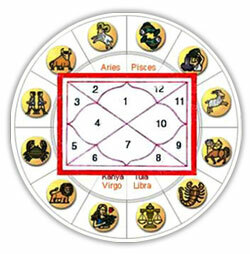 12th House – This positioning affects the 3rd, 6th and 7th houses. The 12th house indicates extravagance or how one spends and manages their monies. The 6th house indicates disease, theft from servants etc. The native is likely to have problems with blood, hypertension and acidity. Mars by nature is a hot planet and pays a significant role in our horoscopes. It is the presence of this planet that is believed to influence our actions and our ability to express emotions. From a positive perspective, it is this planet that influences the nature of a brave warrior; one who is ruthless and brave. If the planet offers a correct balance in terms of energy – it can have some very positive influences in our life. Yet, there aren't many people who have this positive and dynamic balance and it is because of this, that this volatile planet is most feared in Vedic astrology.